Oh, yeah. It's silky. Smooth. Luxurious even. But this chocolate cheesecake also happens to be ridiculously easy (and quick) to make. Mix cookie crumbs, sugar and butter until well blended; press onto bottom and 1-1/2 inches up side of 9-inch springform pan. Microwave 6 chocolate in microwaveable bowl on HIGH 2 min. or until melted, stirring after each minute. Blend next 4 ingredients in blender until smooth. With blender running, gradually add cream cheese through opening at top of blender, blending until smooth. Blend in melted chocolate. Pour into crust. Bake 50 to 55 min. or until center is almost set. Run knife around rim of pan to loosen cake; cool before removing rim. Refrigerate cheesecake 4 hours. 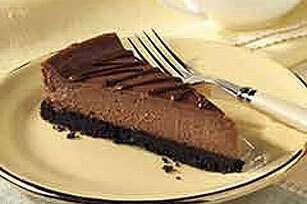 When ready to serve cheesecake, melt remaining chocolate; drizzle over cheesecake. Substitute 60 crushed vanilla wafers for the crushed OREO Cookies. If baking cheesecake in dark nonstick 9-inch springform pan, reduce oven temperature to 300°F.